Location: Just over half a mile to the south east of the roundabout at Afon Wen on the A497. Present state: The only surviving station building is the station master’s house, which was located on the north side of the track from the Caernarfon branch. This is now in use as a private dwelling. None of the platform buildings have survived, and the ‘down’ platform no longer exists. The southern edge of the island platform is intact, but the branch side has been filled in, and the only evidence of the junction that can be seen, is the earthworks of the line heading north. The single track Cambrian line is still open and passes south of the island platform. 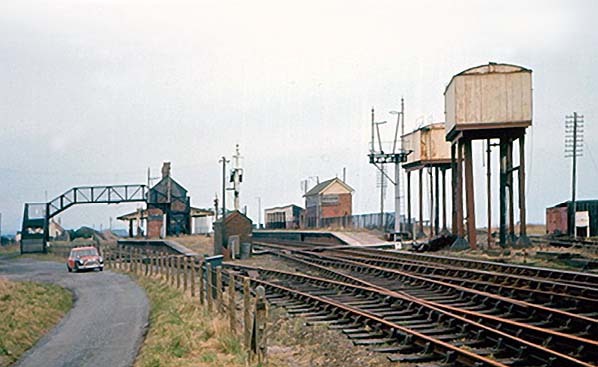 Notes: Afon Wen station was located on the Cambrian Railways (CaR) Dovey Junction – Pwllheli line east of the junction with the Carnarvon Railway’s (CR) line from Menai Bridge. The station was in an isolated location about half-a-mile south of Afonwen on the edge of the Irish Sea. The line between Dovey Junction and Pwllheli was authorised as part of the Aberystwyth & Welsh Coast Railway on 22 July 1861 but, owing to difficulties in crossing the Dyfi estuary, progress was slow on the northern section. The line became part of the CaR on 5 August 1866. On 29 July 1862 the Carnarvonshire Railway (CR) was authorised to build a line between Caernarfon and Afon Wen. In October 1866 the largely completed CR was inspected, but its opening was not approved until 2 September 1867 by which time all work was finished. The CaR was not completed when the CR opened so an agreement was reached by which the CR operated its trains between Carnarvon Pant and Criccieth, Porthmadog, and Penrhyndeudraeth. 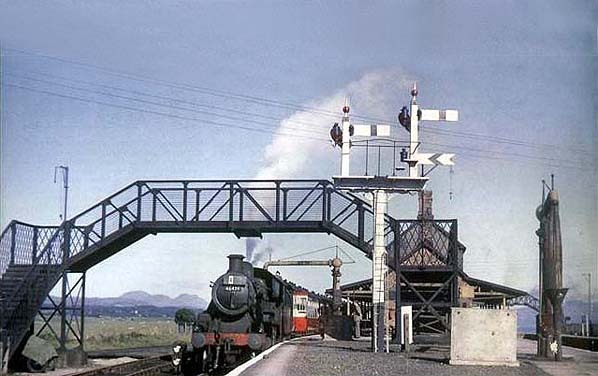 The CaR Dovey Junction – Pwllheli line opened throughout on 10 October 1867.
anticipated that most of the passengers using Afon Wen would be changing trains between the two systems, but access was provided to the station from the locality via a narrow unmade lane. 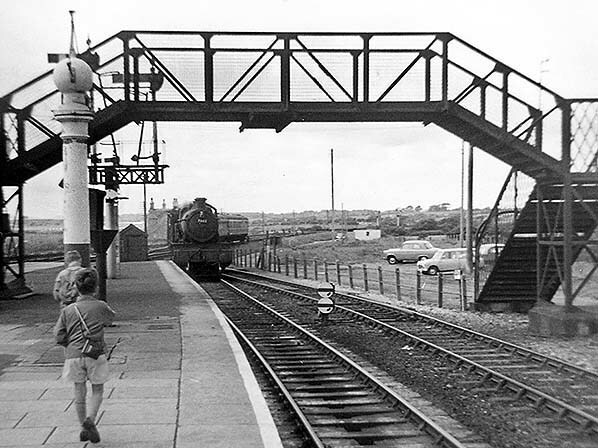 A footbridge at the western end of the island platform connected it to the lane, but the bridge was little used as most of the local population were staff housed in railway cottages west of the station site, south of the tracks. The island platform served the up (Pwllheli direction) main line at its southern face and the up passenger loop on the northern side. The up main line platform was numbered 2 and the up loop 3; CR trains generally used platform 3.
box, which controlled traffic movements at the station, was also located on this platform, towards its western end. Signalling along the main line and up to the point where the CR diverged was the responsibility of the CaR. On the north side of the line, adjacent to the station, was a house for the stationmaster. All of the station staff were CaR employees. Afon Wen also had facilities for watering locos – there were two water towers - and several areas where ash and clinker could be disposed of. There was also a turntable on the site in the early days. At the Porthmadog end of the station there were sidings, but no freight handling facilities other than to re-marshal traffic moving between the two companies. All sorting of freight traffic was carried out by CaR staff. Although the station had all of these facilities it could be a bleak place during inclement weather as it was so close to the sea. line through the centre of Caernarfon, it was running trains between Afon Wen and Bangor. By December 1895 Afon Wen had eight up and 13 down departures on Monday-to-Saturday and two extra workings on Mondays, as shown in the table below. LNWR line trains heading away from Afon Wen became up workings once they had diverged from the CaR line. 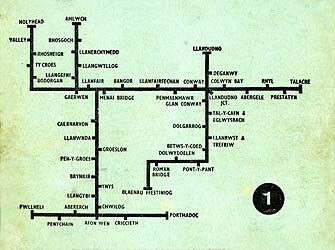 On Sundays there was one train to Barmouth, one to Portmadoc, two to Pwllheli and one to Bangor. In summer 1904 there were eight passenger arrivals from the LNWR line and eight departures. There were also three goods services from and to the LNWR line. In 1922 the CaR was absorbed into the Great Western Railway (GWR). The following year, on 1 January 1923, the LNWR became part of the London Midland & Scottish Railway (LMS). By the summer of 1928 the LMS was operating ten trains to and twelve trains from Afon Wen. As part of through-running agreements dating back to the days of the original companies, through coaches were run to Pwllheli and Porthmadog from the LMS line; they were attached to GWR trains at Afon Wen. 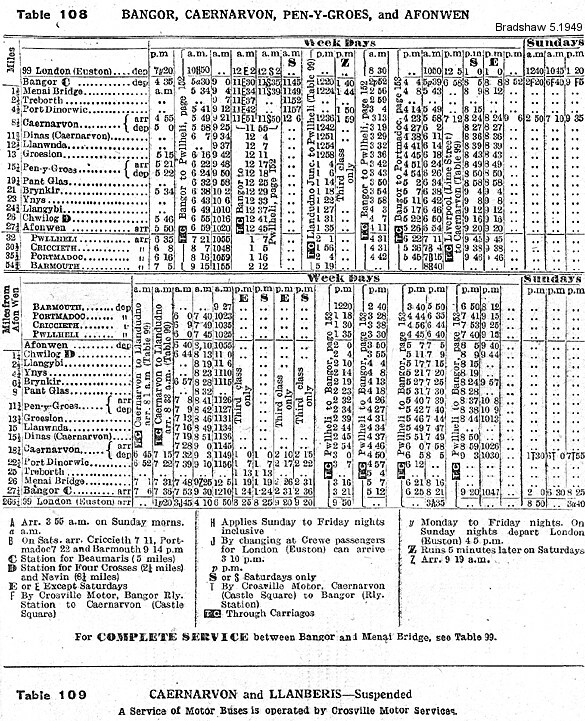 As well as local trains the GWR also operated through services to London Paddington. Interestingly the LMS offered through coaches to London Euston from Afon Wen but they would not have been competitive with the GWR services. By the 1930s Wales had become a popular holiday destination, and during the summer months there were over one hundred train movements each day at Afon Wen. many trains were run for naval personnel. After the war the Butlins camp was handed back to its owners and completed. It accepted its first holidaymakers in the summer of 1947. It was planned that most of the guests would reach the camp by rail, and special services would be run to carry them. The platforms at Afon Wen were extended at the eastern end to accommodate these longer trains. 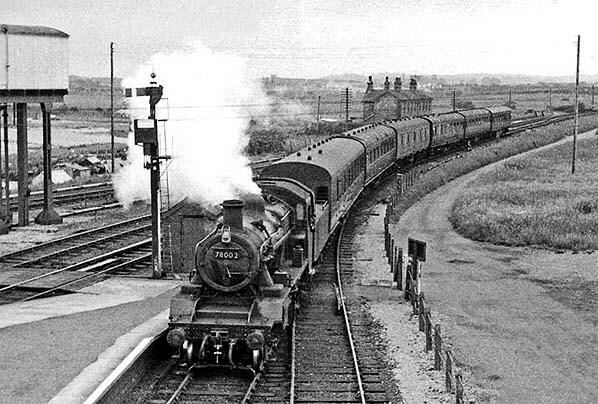 Trains ran from the GWR and the LMS systems and went direct to the camp, where station facilities were provided. Trains coming off the LMS line had to reverse at Afon Wen as they faced the wrong way when they came onto the GWR line. Throughout the 1940s three freight trains ran to and from Caernarfon or Menai Bridge. from the London Midland Region. Saturday summer trains were frequently ten, but up to twelve, coach formations. Between Bangor and Penychain these holiday trains were often worked by Stanier 2-6-4 tanks, allowing the larger locos, which had brought them there, to be serviced and turned on the shed. Many of them were double-headed for the last stage of the journey, with two tank engines coupled bunker-to-bunker to ensure that the pilot loco always faced forward. Local passenger services over the Afon Wen – Menai Bridge line in the 1950s were generally three or four coach formations, although the first train of the day was six coaches, and known as the ‘Afon Wen Mail’. The two mail coaches were dispatched at Afon Wen. During the winter period the line was much quieter, but even so Afon Wen still had ten up and 21 down trains in the winter of 1958/59 on Monday-to-Friday as shown in the table below. A number of the Pwllheli services had arrived from Bangor as down trains and reversed at Afon Wen, becoming up services. Other trains from Bangor terminated at Afon Wen before returning to Bangor. Many of the services from Bangor were operated by DMUs at this time. By the 1950s the refreshment room did little business other than with railwaymen. It was run by a local woman and had become notorious for selling poor quality beer. The railway author Bill Rear, when working for the railway as a fireman, ventured into the refreshment room on his first visit to Afon Wen. A pint of beer was slammed down in front of him and, being young and inexperienced, he drank it as he did not want to offend the woman. He spent the journey back to Bangor being violently sick and never went into the refreshment room again. When the woman retired nobody could be found to run the refreshment room and it had fallen out of use by 1960. The building was boarded up. On 1 January 1963 major boundary adjustments were made by British Railways. One effect was to transfer a large area of the Western Region (WR) to the London Midland (LMR), including all of the surviving ex-Cambrian Railway system. Thus the Dovey Junction – Pwllheli line, and Afon Wen, joined the LMR. Chocolate-and-cream totem name signs had been installed by the WR at Afon Wen station in the late 1950s, but they remained in place during the station’s short spell in the LMR. 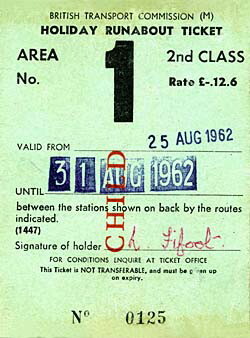 For a period between 1950 and 1958/9 LMR timetables referred to the station as Afonwen, but the WR (as on their totems) preferred the two-word form of the name. Afon Wen station was not earmarked for closure, considering that its principal role was a junction, which would cease when the Menai Bridge route closed; however Beeching also spared other stations between Dovey Junction and Pwllheli – such as Black Rock Halt – which would have seemed strong candidates for closure. On 27 December 1963 the formal proposal of closure was published for Afon Wen – Menai Bridge, this time including Afon Wen itself. The line closed to all traffic on Monday 7 December 1964, the last trains having run on the previous Saturday. A defining feature of the Great Western Railway in Wales was its inheritance of junctions in unlikely and inconvenient locations. Afon Wen was a splendid example, along with Moat Lane Junction, Talyllyn Junction, Dovey Junction and Barmouth Junction (renamed Morfa Mawddach in 1960). It is remarkable that the last two are still open. down line through the station became a bi-directional single track, although the up line and the up passenger loop remained in situ until about 1970. The station building survived until the second half of the 1970s. By May 2012 only the stationmaster’s house and the eastern end of the island platform survived. The line between Dovey Junction and Pwllheli was still open, being served by Arriva Wales trains. 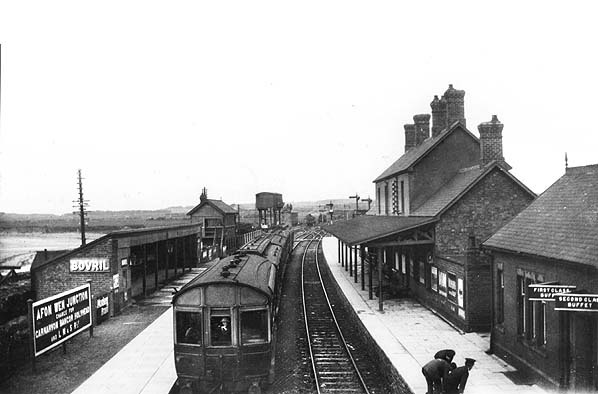 Looking west at Afon Wen station in the early 1930s. Standing at platform 1 the down main line platform is a Pwhelli train. At the rear of the train is a former Cambrian Railway observation saloon. The Cambrian had two observation saloons that came into service in 1915, two lavatory third coaches dating to 1894 having been converted for the purpose. The observation coaches remained in use until 1936. The station nameboard, seen to the left, advised passengers that they could change at Afon Wen for the LMS line to Bangor. the name of Afon Wen station. 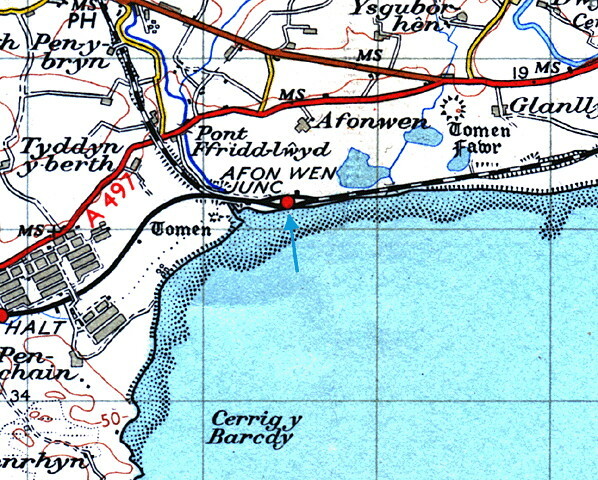 Afon Wenshown on a six-inch scale map from 1899. 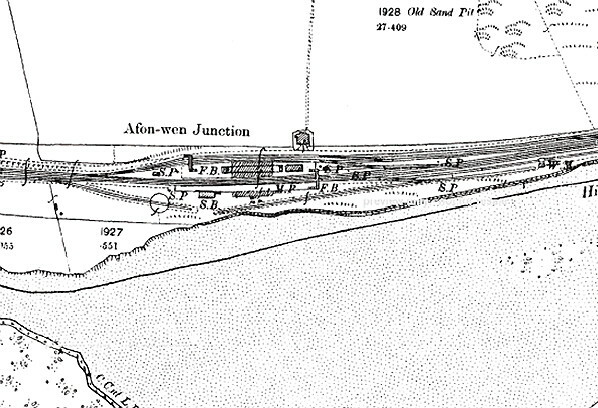 Afon Wen station shown on a 1900 map. 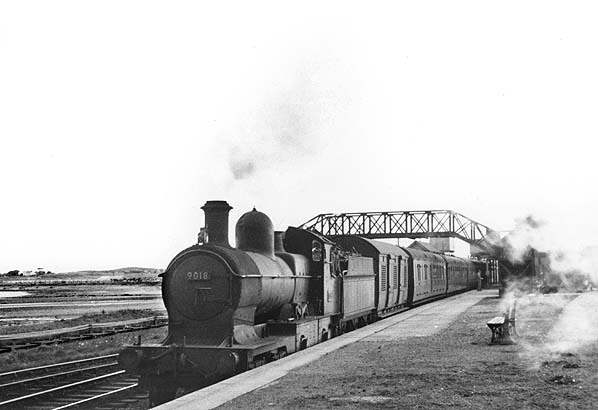 A Western Region service stands at Afon Wen platform 2 on an up express working in August 1953. At the head of the train is ex-GWR locomotive No. 9018. The locomotive was a rebuild of a Duke boiler and a Bulldog frame. This Collet-designed 4-4-0 was built in April of 1938 at Swindon and was one of a class of 29. Withdrawn in June 1960, it was cut up at Swindon by the end of the August. There is one Dukedog preserved: 9017 is normally found at the Bluebell Railway. Afon Wen station looking east from the western end of the station in July 1954. To the right can be seen platforms 1 and 2. Standing at platform 3 in a London Midland Region train. At the head of the train taking on water is locomotive No. 46428. It is carrying class A headcode, (express passenger) and is an Ivatt-designed 2-6-0 class 2. Built at Crewe works in December 1948, this loco was withdrawn from 5B, Crewe South she,d and sent to Woodhams scrapyard in Barry. Happily, this loco was rescued and in 2012 was awaiting restoration. Looking west at afon Wen in 1959. The western end of Afon Wen station looking west in June 1962. A train from Pwllheli is seen arriving at platform 3. At its head is locomotive No. 78002. This locomotive entered service in December 1952 at Oswestry shed, 89A. This Riddles-designed BR Standard Class 2, 2-6-0 was based on the Ivatt class 2s built for the LMS, with modifications. It was reallocated to 89C, Machynlleth, in May 1953, and after spells at 27D, Wigan, and 8K, Bank Hall, it was finally withdrawn in June 1966 from 10D, Lostock Hall shed and scrapped by Central Wagon Co, Wigan in October of that year. Afon Wen station looking east in the late 1960s. The rails leading to platform 2 and 3 had rusted by this time. Signal arms had been removed and the station was boarded up. Afon Wen station site looking east on 25 May 2012 as an Arriva Trains class 158 DMU passes through on a service to Birmingham New Street.